ON 24 JANUARY 2004 NASA achieved the still rarefied feat of successfully landing a rover on Mars. 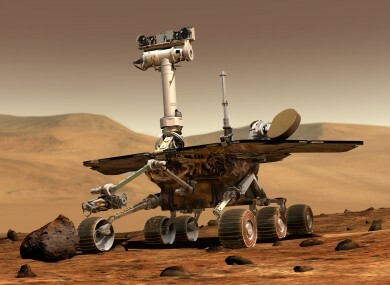 Opportunity was only supposed to explors the Martian surface for 90 days but today, 10 years on, it has driven driven for 40 km and is still going. One of its six wheels and two instruments stopped working long ago. It has an arthritic joint. Its flash memory occasionally suffers a senior moment, but it is still going. Opportunity’s twin, Spirit, stopped working in 2010 after getting stuck in some Martian sand. Their original goal was simple, to investigate whether there were once large bodies of standing water on the Red Planet. Within just months of landing on the surface Spirit had verified that the 100km wide crater it landed in was indeed a vast lake in its early history, Opportunity’s landing was nothing short of remarkable. It scored a ‘cosmic hole in one’ by inadvertently landing within a tiny 22m wide crater upon a vast flat plain called Meridiani Planum, suspected to have been a sea on Mars billions of years ago. When Opportunity sent back images from the Meridiani Planum, the structure and salt deposits shown verified for that it had indeed been a sea on Mars billions of years ago. 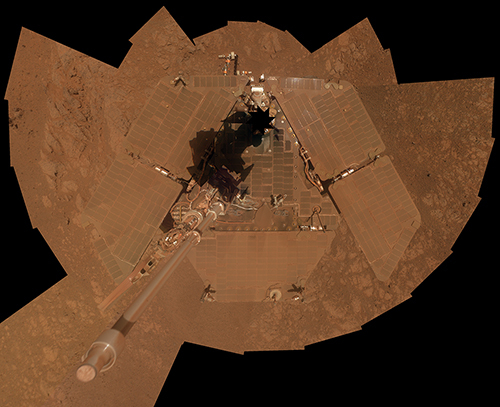 Since then, Opportunity has survived four Martian winters at temperatures below -100 degrees Celsius and trekked for three years across 20 km of sandy plains to its current location at the rim of Endeavour Crater. “It has been reprogrammed from Earth to be an autonomous artificial–intelligent ‘thinking machine’ capable of planning excursion and scientific investigations on its own and without instruction from Earth,” explains Nolan. The power levels on the solar-powered rover have unexpectedly improved and a recent selfie by Opportunity showed dust on its solar panels wiped away by blowing winds. In 2012, Opportunity was joined on Mars by Curiosity, which is currently rolling across bumpy terrain toward a mountain. With snazzy tools like a laser, Curiosity quickly became the world’s favorite rover. But Opportunity snatched some of the attention back earlier this month when it discovered a rock shaped like a jelly doughnut that suddenly appeared in its field of view, probably after its wheel kicked it up. Scientists said it’s unlike any rock they’ve seen on Mars before. It costs about $14 million a year to maintain Opportunity and NASA periodically reviews missions that have been extended to decide where to invest scarce dollars. In several months, Opportunity will decamp from its winter haven and head south to what scientists are calling the mother lode a clay-rich spot that should yield more discoveries. - Additional reporting was provided by Associated Press. More information on Opportunity and its ten years on Mars can be found on the official NASA mission website. Email “Is there life on Mars? Ten years on the Opportunity rover is still looking ”. Feedback on “Is there life on Mars? Ten years on the Opportunity rover is still looking ”.